If you've arrived here from Judith Gowdy's blog, you're in the right place. If you've happened to visit my blog from somewhere else, you might want to go back to the Skipping Stones Design blog to start at the beginning so that you don't miss a thing! This is a very special blog hop in honor of Heather, Skipping Stones Design's owner and designer extrordinaire, who is taking a bit of a hiatus from SSD to refocus on life and family. And if you've been following my blog for a while, you may remember that I was lucky enough to be a part of the SSD DT for a year and I'm so appreciative to Heather and SSD for that time! So when I was asked to be a part of the blog hop, it was a no-brainer that I wanted to join in on the fun! Anyway, enough with the sappiness, here's my card using my favorite stamp set, Uplifting. Just a reminder about our PMS sale and an update on all the sets that are sold out. Many other sets are close to selling out so get your favorites while you still can!!! Remember, during the infamous PMS sale or Purchase More Stamps sale, the more you buy, the more you save! Buy ONE set: Enter PMS1 for 5% off! Buy TWO sets: Enter PMS2 for 10 % off! Buy THREE sets: Enter PMS3 for 15% off! Buy FOUR sets: Enter PMS4 for 20% off! Buy FIVE sets: Enter PMS5 for 25% off! Buy SIX or MORE sets: Enter PMS6 for 30% off! I do plan to leave the store open and continue to make available some of our most popular sets, the inventory of some of our other sets will not be replenished once they sell out. Now is the time to pick up a favorite set, or two, or five before they are gone forever!! 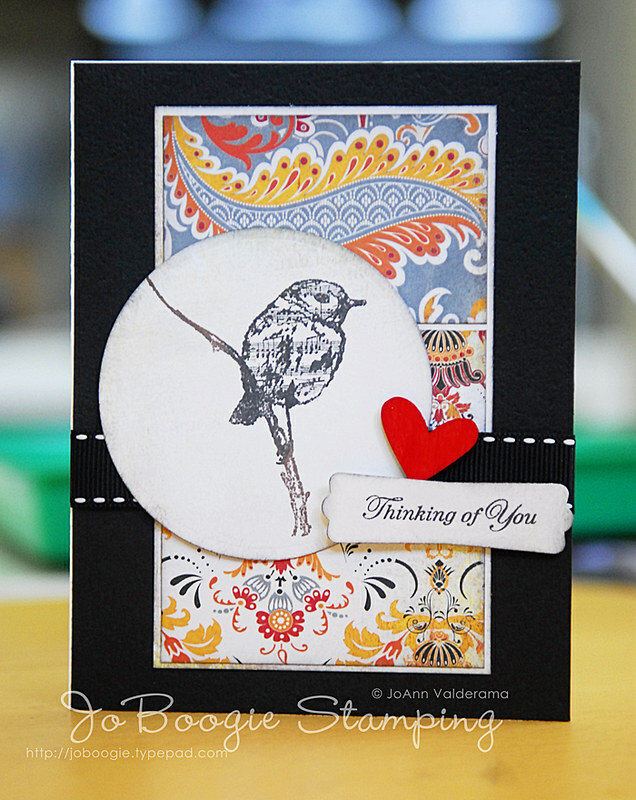 Anyway, now that you're done here, head on over to Pamela Young's blog for more inspiration! Don't forget to leave comments along the way - you may win an SSD set! Good luck! I almost can't believe I started this journey as an SSD Design Team member one year ago. ONE YEAR! That's HUGE! I want to thank everyone on the DT, the fans of SSD, and especially Heather and her fabulous stamps for making this year as awesome as it was! I've enjoyed all of the comments, the visits, the fun stamps to play with, and the challenges to keep my creative juices flowing. :) It's been one helluva ride. In all honesty, I almost stayed on for another 6 months, but I thought that I would give other ladies a chance to play, and I didn't think it would have been wise - especially with a baby on the way in November! But I'm confident that the returning ladies and the new team will be doing a wonderful job. I really can't wait to see what they create! Happy Tuesday and don't forget to play along with us this week! Skipping Stones Design Sketch #142! Here's my take on this week's throwback sketch! So this sketch was super fun to work with and I specially loved playing with my beloved Heartsong 2 set for the week as well! Skipping Stones Design Featured Friday! Thanks for stopping by my blog today! 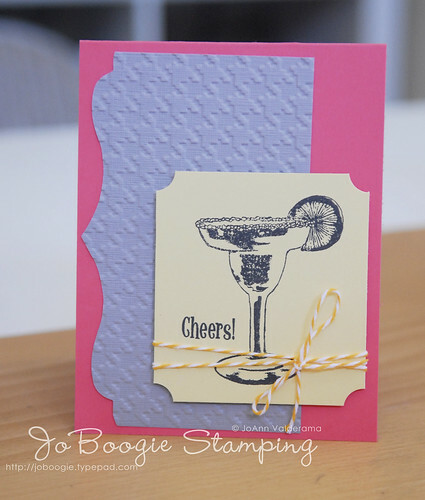 I've got a great card to share for my assigned Skipping Stones Design Featured Friday post - take a look! But anyway, I'm REALLY loving hexagons right now - I think I've said that already! haha I think the cool angles of the hexagons and the softness of the Heartsong 2 set really go together quite nicely and packs a really fun PUNCH. And guess what? Skipping Stones Design is having a PMS (purchase more stamps!) sale right now! Skipping Stones Design August Sketch Challenge #1 (SSD #140)! It's a new month and it's back to sketches for our Skipping Stones Design Challenges. We've got some special guests lined up for the month - we're welcoming Annette Witherspoon and Tenia Nelson as our guest designers and the fabulous Becky Fleck as our guest sketch designer! However, this week we're doing something different and taking it a bit old school... We're going back to the Skipping Stones Design's first sketch and using that as our challenge for the week. Fun, right? supplies: CS: kraft (Paper Accents), yellow (PaperTrey Ink); DP: My Mind's Eye, Studio Calico; stamp set: Heartsong (Skipping Stones Design); inks: Rich Cocoa (Memento), Chocolate Chip (SU! ); brads: SU); modern label punch (SU! ); dimensional adhesive. I used some scraps in my stash - including some fabulous scraps from Studio Calio and voila! We have ourselves a really simple card. Hope you all get a chance to play along with us this week at Skipping Stones Design! Can you believe it's August already?! In 2 weeks I'l offically have a kindergartener! I'm freaking out a little over here! Skipping Stones Design #138 - Team Blue! Since I was unable to make my commitment to Team Red last week over at Skipping Stone's Design Inspiration Challenge, I jumped on the BLUE team! So the colors of the inspiration photo this week is melon, mango, yellow, and grey. It was a challenge for me to work with them, but I actually do love the way it came together. Excuse the picture - My melon didn't want to cooperate and didn't photograph well! I decided to freshen it up since it's the middle of summer and use the adorable Margarita Birthday set. Super fun! Anyway, I hope you get a chance to join us for this fun color inspiration challenge! We can't wait to see what you create! Skipping Stones Design #136 + Blog Hop! 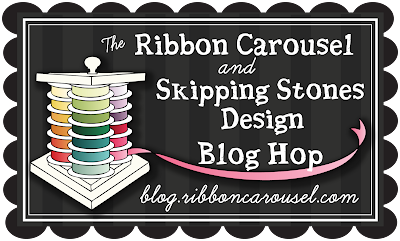 Welcome to my stop for the Skipping Stones Design New Release Blog Hop! This week we're featuring the newest set, Darling Damask with our projects! If you arrived here from Stephanie's blog, you're at the right place. If not, be sure to head back to the Skipping Stones Design blog and start from the beginning - you wouldn't want to miss a thing! Hope you enjoyed my card today. Your next stop for the blog hop is the awesome Laurel Seabrook! SSD Tips and Tricks Thursday by ME! I've got a super simple organizational tip over at the Skipping Stones Design blog - Hope you check it out and find out how you can win this awesome piece of blog candy I'm giving away! 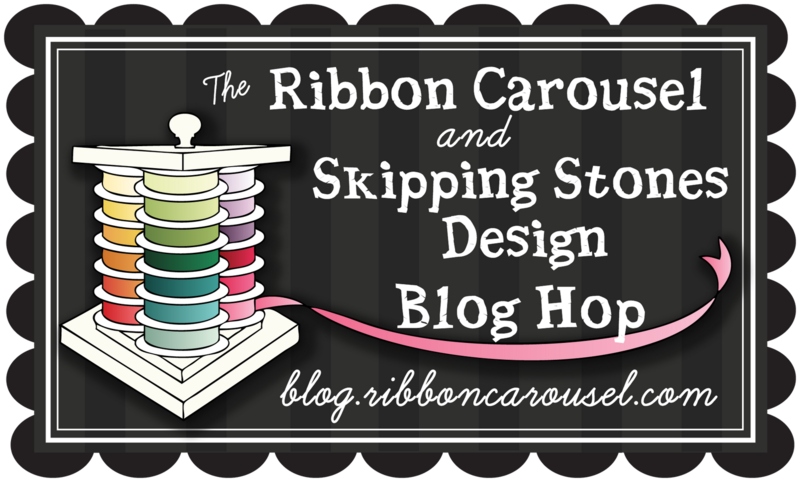 Skipping Stones Design #135 + Blog Hop with The Ribbon Carousel! Hey everyone and Happy 4th of July! I know it's kind of strange to see me posting a Skipping Stones Design project on a WEDNESDAY, but it's a special kind of day today! We're hopping with The Ribbon Carousel Team! Check out my project this week! 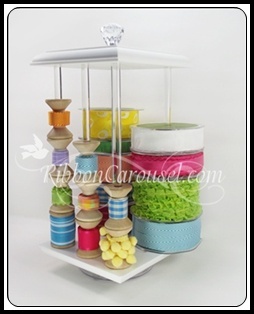 I used the adorable Cupcake Cutie set (Our featured set this month - *HINT HINT*!) and some fabby-fab ribbon from The Ribbon Carousel. I really love how things that you may not *think* go together, really DO! AND, they make for one awesome 4th of July card, don't you think?! Skipping Stones Design Sketch Challenge #134! It's time for a fun sketch challenge at Skipping Stones Design! 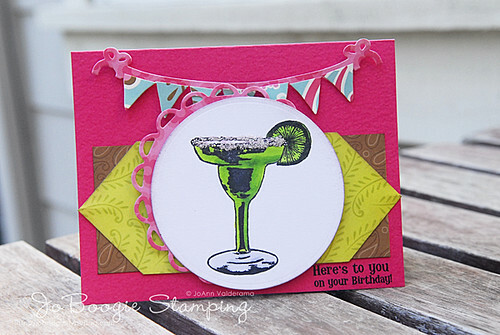 This week the designers are all featuring cards using the images from the upcoming Margarita Birthday set! My husband was taking pics of some stuff he's planning to sell on Craigslist so I was able to to steal a camera and take a picture of my project outside (I'm really loving this look!). Here's what I've created for you today! To create the little salt around the rim of the glass I used some Diamond Stickles - definitely a favorite. I dont' know why I don't use it more! Instead of thin layer, I put it on pretty thick to create the "salty" look. I think it works, don't you?